Day 1.. red.. when I think of "red nails", for some reason my mind immediately thinks of plaid. No idea why, it just happens. I grabbed 4 different enough shades of red polish (I think I only own maybe 6 red polish period?) 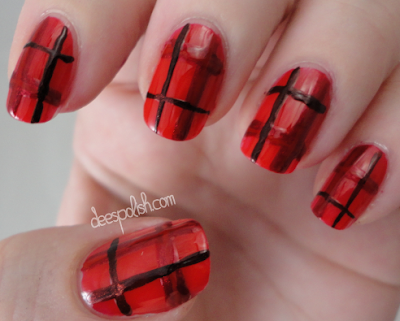 and went with a simple plaid. I feel like this photo (to me, anyways) makes my lines look super wonky, enough though I don't remember them being so awful irl. Who knows. The reds used are: Essie Lollipop, China Glaze Cranberry Splash, China Glaze With Love, and OPI German-icure By OPI. I also used my little brush for the lines. I look forward to this month of challenge activity.. and I know there are a few others participating - cannot wait to see what is done! !